Round 1in the current wrestle between the hulking cigarette industry and the government goes to the US administration. Just when the tobacco lobby had heaved a collective sigh of relief at having squeeze in its favour a relatively mild tax of 69 cents per cigarette pack, when the government backhanded with a vengeance. Late June, Thomas E. Sandefur Jr, the chairman and chief executive of Brown & Williamson Tobacco Corporation found himself in the dock for his company's alleged production of Y-1, a genetically engineered tobacco plant that would more than double the amount of nicotine delivered to smokers. 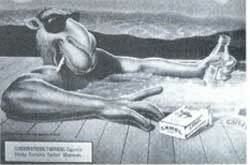 The new tobacco was used in well known cigarettes brands such as Viceroy, Richland and Raleigh. In a damning indictment of the company, the no-nonsense Commissioner of the Food and Drugs Administration (FDA) David Kessler disclosed that Brown and Williamson had grown the plant in Brazil and stashed away at least three million pounds of the specially developed tobacco in company warehouses in the US. Sandefur fought back hard, brandishing charges of "McCarthyism" against the House Energy and Commerce Subcommittee on the Health and the Environment, which heard his five-hour testimony. In his defence, Sanderfur maintained "The brands that used Y-1 delivered essentially the same nicotine as the products they replaced." However, Sandefur found it less easy to dismiss the charge that the company used ammonia as an additive to increase which increased nicotine delivery in cigarettes. Brown & Williamson is only one of the many asphyxiated cigarette manufacturers in the US who are turning blue in the face holding their breath for the next in a series of government uppercuts. Dramatic revelations about major cigarette manufacturers surface so frequently in the US these days that often it seems that the once unassailable multi-billion dollar industry is in danger of choking on its own poison. The first blow to the industry was an unexpected ABC (American Broadcasting Corporation) television news programme earlier this March, in which Philip Morris, the manufacturer of the hostelling Marlboro cigarettes, was charged with adding extra nicotine to make cigarettes addictive. Though the company indignantly slapped a $ 10 billion libel suit on ABC, the damage had been done. In April, close on the hells of this disclosure, top executives of the 7 largest American tobacco companies were subjected to a gruelling cross examination by Henry Waxman, head of the House of Representatives Subcommittee on Health and Environment. In the firing line was William Campbell, president of Philip Morris USA, who was forced to admit that since 1983 the company had twice suppressed publication of a study showing nicotine's addictive effects in rats. Lorillard Tobacco's vice-president, Alexander Spears, too pleaded guilty to the charge that he had mislead Congress by giving data showing a drop in the nicotine content of the company's cigarettes. Kessler, who has emerged as a zealous crusader against the US tobacco industry, now intends to use such evidence to push for the regulation of tobacco products as drugs. This shrewd strategy could in one fell swoop remove cigarettes from the over-the-counter market and make them available only through prescription. But unlike other drugs, nicotine has no curative effects, so cigarettes wouldn't be classified as a prescriptive drug either. * The Pentagon has banned its 2.6 million employees from smoking in all military workplaces, ranging from military bases to tanks on the battlefield. * The Occupational Safety and Health Administration has proposed a ban on smoking in the workplace. * Several states have launched an anti-tobacco offensive. Florida and Mississipi have signed legislation that would enable them to recover the public costs of dealing with tobacco-linked diseases from tobacco companies. Maryland is likely to impose a radical ban on smoking in all workplaces, including bars and restaurants. The New Jersey Supreme Court recently ruled that municipalities have the right to ban cigarette-vending machines. * Waxman, a staunch foe of the tobacco industry, has sponsored a bill that would ban smoking in virtually all non-residential buildings. The only concession made for smokers is the creation of special smoking areas. Lawyers too have jumped on to the anti-smoking bandwagon. New Orleans lawyer, Wendell Gauthier, leads a group of high profile lawyers in a $ 5 billion class action suit on behalf of anyone addicted to tobacco. * Even private companies have responded to the anti-smoking fervour that has gripped the US. Mc Donald's has banned smoking in 1,400 of its fast food restaurants. Amtrak has announced that 82 percent of its trains will now be smoke free, as against 62 percent in the past. The all American sport of baseball has also taken a knock as 20 major baseball parks are declared no-smoking zones. Is the current hostility to tobacco to be dismissed as typical American overreaction or is there more to it? Though the anti-tobacco sentiments have tended to take extreme forms of late such as a an on hiring smokers by corporations such as Lockheed -- only to be stalemated by a host of state laws that seek to protect smokers against such discrimination--there is no denying that a groundswell of concerted opposition from the government and activist groups has driven the tobacco industry against the wall. This is reflected in the declining political fortunes of the industry. Despite their lavish wooing of Congress members, for the first time the tobacco lobby is outnumbered, 58 to 42, by members of the anti-smoking Congressional Task Force on Tobacco and Health. This coincides with growing government concern about the high health costs of treating tobacco-related illnesses. According to a new study by the EPA a nationwide ban on smoking in most public buildings could save $ 39 billion to $ 72 billion annually in health care costs, most of it from reduced illness and deaths related to second hand smoke. Such estimates are regarded as too conservative by activist John Banzhaf, executive director of the Washington-base Action on Smoking and Health, who prefers to peg the cost nearer $ 100 billion a year. The hostility to the tobacco industry has been steadily on the increase ever since a landmark report by the US Surgeon General in 1964 linked smoking to lung cancer. This paved the way for increased government regulation such as mandatory health warnings on cigarette packs and cigarette ad bans on TV and radio. Meanwhile, medical evidence pointed to a close link between smoking and heart disease, emphysema and low birth weight babies. By 1986, a path-breaking Surgeon General's report on the detrimental effects of passive smoking had brought the emotive issue of environmental damage into the picture as well. However, the real turning point in the anti-smoking movement was the Environmental Protection Agency (EPA) report in 1993 that classified tobacco smoke as a class-A carcinogen and estimated that 3,000 nonsmokers die in the US from passive smoking each year. Yet despite the doomsdayers, the end is nowhere near for the resilient cigarette lobby which has a habit of springing unexpected surprises. Just when the fortunes of Philip Morris were at their lowest ebb with talk off hiving off the tobacco business, a brash new duo had stepped into the shoes of the non-smoking former chief executive and chairman Michael Miles.. Lighting up with Marlboros, new chief executive Geoffrey Bible and chairman William Murray, signalled a new offensive by the company to counter adverse publicity against the cigarette industry. "It's our intention to continue to defend our consumers and our industry as briskly as we can and as strenuously as we can," said Bible. Even under siege, the industry has several ingenious tricks up its sleeves. In California, which has enacted over half of the US's estimated 600 local anti-smoking ordinances, Machiavellian manufacturers have allegedly set up a front organisation, Californians for Statewide Smoking Restrictions, to push for restrictions on smoking. The logic behind this apparent hara-kiri? To preempt tougher local ordinances. No wonder, activists in the US are constantly on their toes. As Stanton A. Glantz, a professor of medicine with the Institute for Health Policy Studies at the University of California at San Francisco and a long time opponent of the industry, points out:"If you want to control malaria you have to control mosquitoes. If you want to control tobacco, you have to understand what the tobacco companies are doing." * An aggressive media blitz that revolves around the freedom of choice argument. By playing on fears of a new era of prohibition where alcohol, caffeine and even high fat foods will be under attack, the tobacco lobby seeks to ride on the wave of American individualism. * Targeting youth, women and vulnerable ethnic groups. Though there has been a dramatic decline in the number of American smokers -- from 42 percent of the population in 1964 to 26 percent currently -- smoking is catching on among African Americans and the very young. High school seniors who smoke increased from 17.2 percent in 1992 to 19 percent in 1993. * According to some estimates, the cigarette industry spends $ 600 million a year on lawyers. With its considerable financial clout, the industry is on a strong wicket to take on anti-tobacco activists. That is just what it has done in a recent case: lawyers for the American Tobacco Company are seeking access to the membership list of a computer network used by anti-smoking groups to formulate strategies against the tobacco industry. The US tobacco industry may be down, but as its new strategies reveal, it is not completely out. For the moment, it is content with snatching an occasional victory such as an easier tax burden or a favourable Federal Trade Commission ruling that allows RJ Reynolds to keep its Joe Camel cartoon character in its popular Camel cigarettes. However, the bruised and battered giant may yet muster strength to throw its equally fierce opponents off balance in round 2. Watch out for smoke signals.